Vacation rental condominium. Sleeps 2, 1 bedroom, 2 bathrooms. No pets allowed. 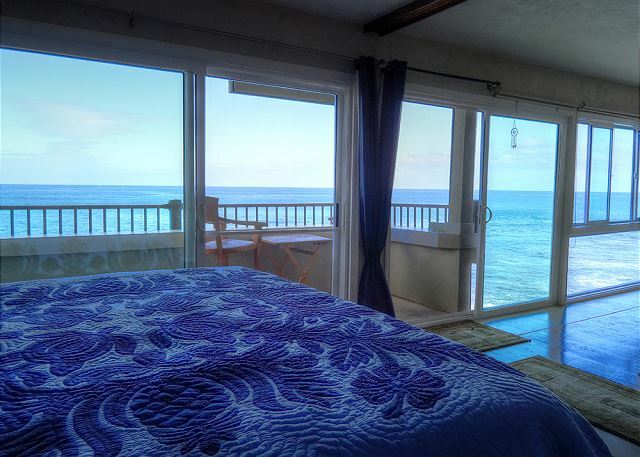 Enjoy an amazing oceanview, and listen to the waves crashing from bed! The living area featuring floor to ceiling glass, the ocean is only a few feet away! Look at that view! Relax on your private lanai! Breathtaking ocean view from the condo! Enjoy an oceanview from nearly all angles! 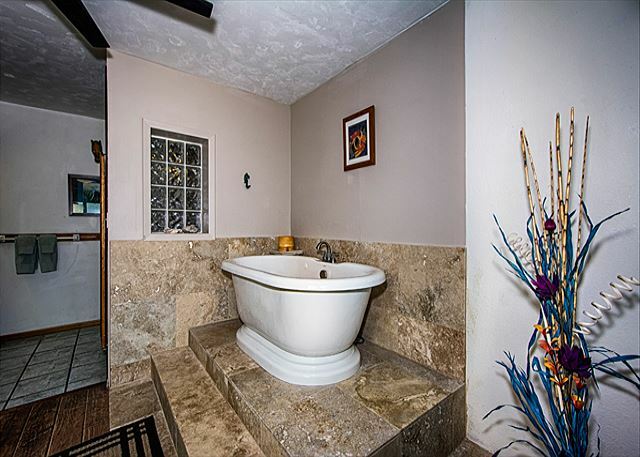 Gorgeous Stand Alone Tub for Soaking! Welcome to the entrance of Banyan Tree 404! A aerial shot of the Banyan Tree pool and hot tub area! No words can justify this amazing view from this spectacular complex! Relax right by the water! Welcome to the Banyan Tree Complex! On the ocean side of Alii Drive! Cruise Ships can be seen from the condo! It does not get more oceanfront than this! Knutson & Associates is very proud to represent this recently acquired unit. Banyan Tree 404 is a top floor condo in a secure and private building with a elevator, pool, spa and barbecue! Look no further to have the perfect vacation! 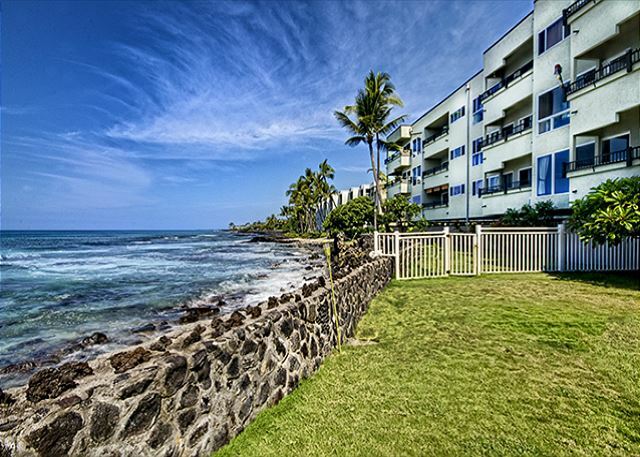 This condo is a true gem in the Kona Sea side. 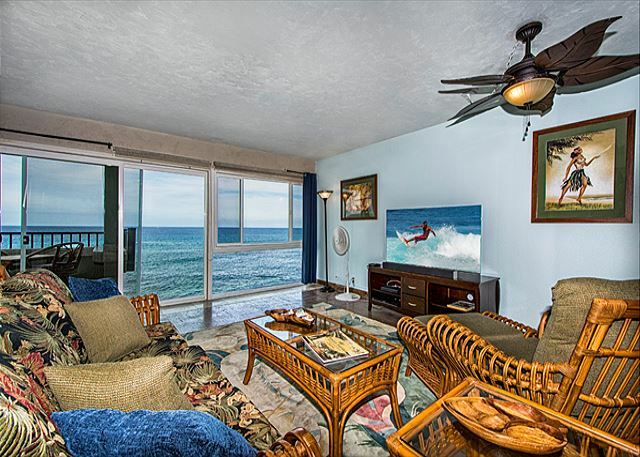 It overlooks the Banyans Surf site(considered the best surf break on the island), walking distance to Magic Sands Beach, and walking distance to the world famous Kahalu’u Beach Park! 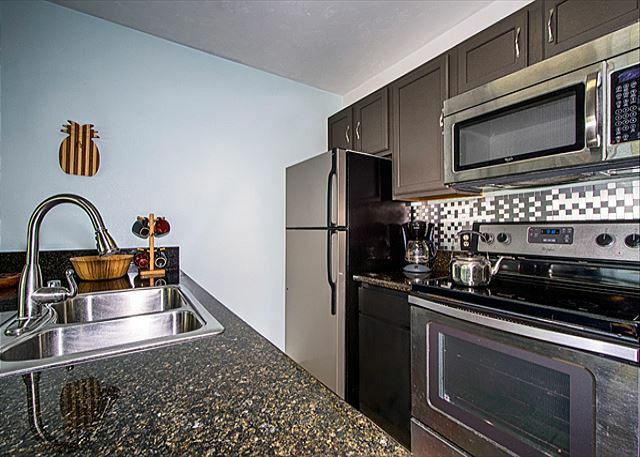 This is offered as an extremely spacious 1 bedroom featuring 1156 square feet. Wow! Wow! Wow! 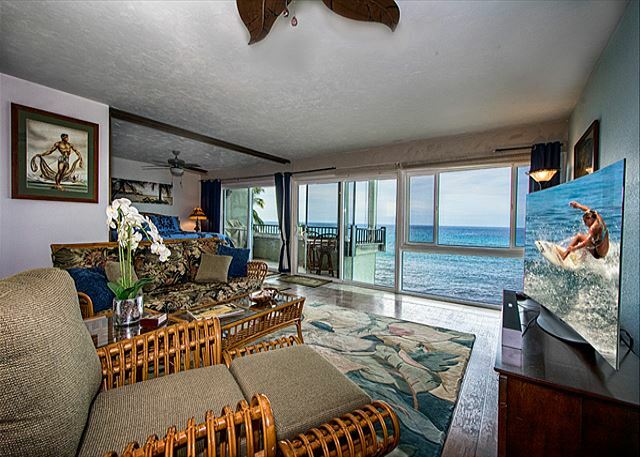 Between the sunsets and watching surfers, whales, dolphins, turtles and the reef fish in the water below, it was hard to leave the lanai every day. We bought some binoculars at Costco for watching all the action. Knutson & Associates were helpful and responsive. They dropped off 3 boogie boards for us to use in a just a couple of hours after we called. We had a most enjoyable stay at Banyan Tree 404D. It was a beautiful oceanfront condo! Furnishings, amenities and facilities were all excellent. Loved the pool and Jacuzzi! We enjoyed every day - just wish we had more time. Convenient location - short distance to Kona. Would love to return. Highly recommended. We really enjoyed our stay at this condo. Very clean. The view is more amazing than photos can show. We loved watching the surfers and could even see fish and turtles in the water! The bed and furniture are very comfortable. The lack of air conditioning did lead to a few uncomfortable nights. There are several fans provided in the unit, but we didn’t seem to be getting much of a breeze off the ocean during our stay in August. Having a clothes washer in the unit was great. The drying rack provided did the job for our things and we did not need to use the dryer, which was great considering the inefficiency of it due to the venting system. The kitchen had modern appliances and was well stocked. Overall this is a great condo! Aloha, thank you for letting us know how your visit went! Our apologies that the Hawaii heat made some of your nights uncomfortable, and we will keep your insight in mind for plans to improve experiences at this unit. We're happy to hear you enjoyed the ocean views and your stay with us. Mahalo! Would be 100% amazing...if only they had air conditioning. Banyan tree 404 and the entire property is great. We were right on the ocean and could listen to the waves all night. The balcony was private and is where we spent most of our time at. Only downside was no air conditioning, and that made it unbearable to be in the condo itself unless we absolutely had to. But it is Hawaii, and you shouldn't be inside anyway. Would recommend to anyone. Aloha, we're so sorry to hear that the Hawaii heat made some of your stay uncomfortable, but we're happy to hear you were able to enjoy your stay and the location. 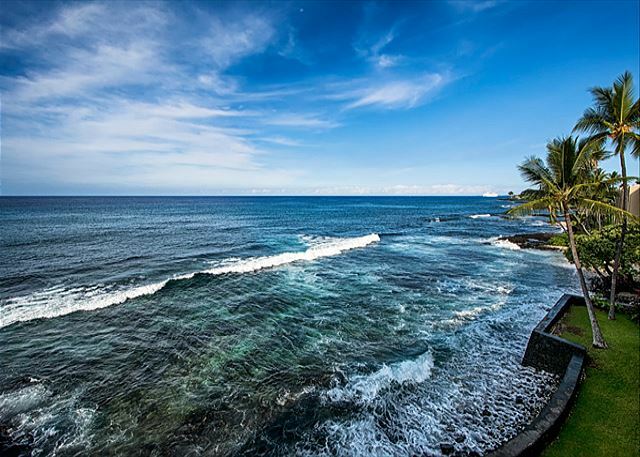 We will be taking your insight to heart in our plans to improve guest experiences at Banyan Tree, and we hope we can provide you with another stay on the Big Island in the future. Mahalo! we loved staying here. Mostly being right above the ocean. My wife and I had a wonderful time at the Banyan Tree. Great location next to beaches and restaurants. There's even a convenience store across the street for essentials! We had a great time relaxing on the porch, enjoying the view, and being entertained by the surfers. We had a lovely time staying at Banyan Tree. The location was perfect for us and being right on the ocean was such a bonus. 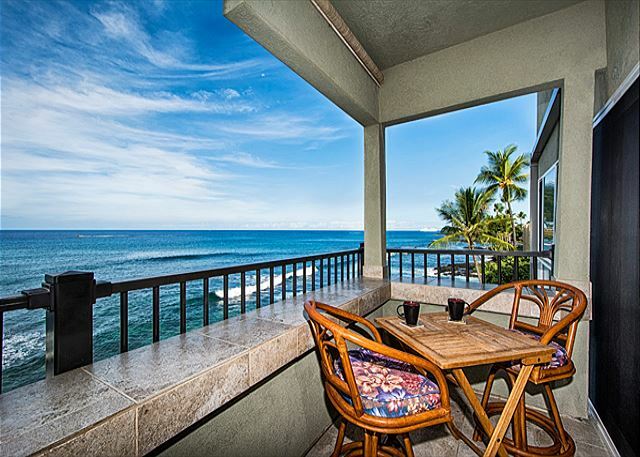 Right next to the property is access to the ocean for surfers along with a popular reef break. We saw them every day and enjoyed the entertainment. 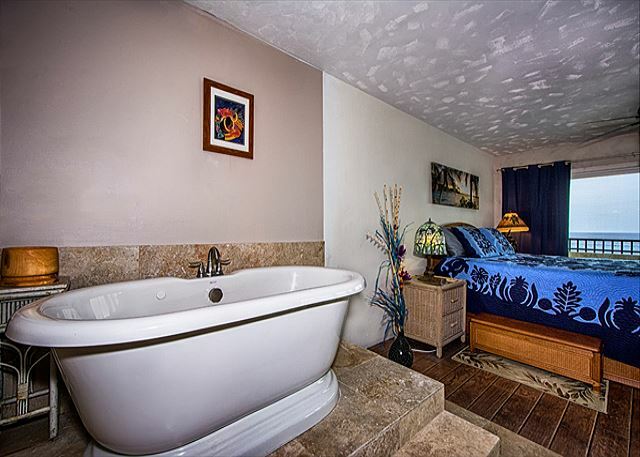 The property is well maintained and overall very clean. 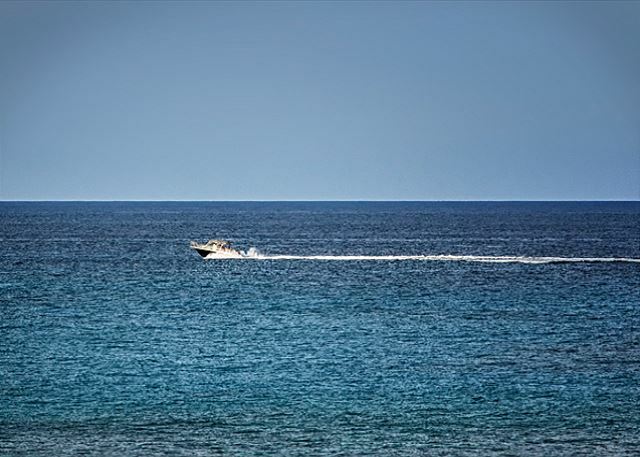 Just a couple miles down the street is a perfect place to snorkel at Kahalu'u State Park.. The kitchen is a bit sparse for cooking utensils and the knives a very, very dull. We only went out for a few meals so this was not ideal for our stay. Other wise everything worked well and we would return for another stay. We loved the location above the waves which lulled us to sleep every night. Couldn’t even hear each other snoring!! The space was clean and had what we needed for our short stay. We would stay here again! Wonderful condo, right on the ocean. The waves lull you to sleep each night and the surfers are fun to watch. 20 minutes walk to Magic Sands beach and the Poke Shop is just two doors away. Air conditioning is nonexistent but plenty of fans provided. Don’t bother using the dryer, the suite will get hot. Just hang your clothes overnight. Job done. Some upgrades needed but that will come in time. We will definitely be back. 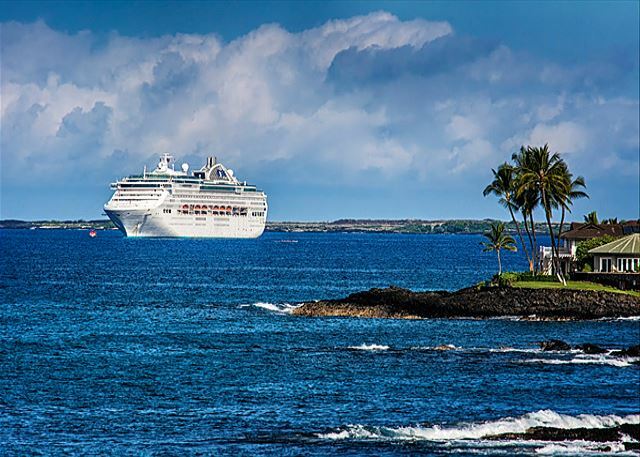 You will need a car to get to Kona or anywhere else on the island. Property was very clean, and all amenities you need. We did have some difficulties with tv at times, but we didn't really need it in that special location, 10 out of 10. Air con would be the icing on the cake we would def come again. Can't beat the view! Nice quiet building with easy access to everything you need in Kona. This is a lovely place with incredible views. Location is great for snorkling, diving and surfing. No AC, so a little warm but cool ocean breezes help a lot. Very romantic and peaceful! Overall the condo and location met our vacation needs. The mornings and sunsets on the lanai were absolutely stunning. The condo lacked air conditioning but with the fans on non stop, it was tolerable. I found it interesting that the cleaning instructions mentioned the guests pay to have the windows cleaned by a local business. Overall our stay was nice. We came here for our first anniversary and had a great time. The Sea view was of course very beautiful, house was clean, the bedroom (and the attached tub) were romantic, the kitchen was stuffed with a lot of cookware, dishes and some basic stuff like salt, oil, vinegar. 2 bathrooms made the "getting ready" quicker. the location was closer to safeway/walmart/costco. Alii drive had nice mini-downtown kind of setting a couple of miles away. The two things that I wished for were Air conditioning (it was very humid, even during nights), and some bathroom stuff (soap, shampoo etc.). Other than that, it's perfect. I was a little concerned about the lack of a/c but I would have probably never opened the windows and missed the great breeze and sounds of the surf...the best I have slept in a long time! It's a great location...I really enjoyed watching the surfers in the morning and the proximity to town and the local beaches. I was there to cheer on my friend in the Ironman and it was the perfect home base! Pictures provided on the website were right on...or maybe didn't do the view justice! I would stay here again. I didn't really have need to contact the owner/manager so I suppose that says it all! Location was perfect. Literally as close to the water as you can be. The condo was stocked with most things that we needed for a comfortable two week stay. 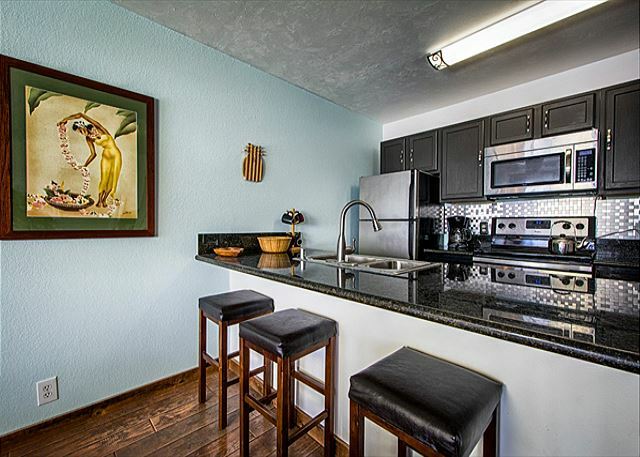 The property was well managed and in close proximity to a lot of great shopping and dining. We had a great time at 404 - the unit is otherwise quiet except for the ocean waves noise, which we really enjoyed. It's good point to plan visits throughout the Big Island. We were literally on the water. 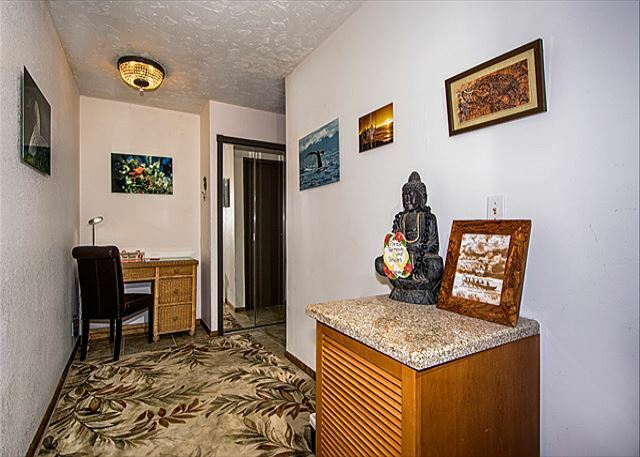 This unit is small but had everything you need for a perfect stay in Kona. Waves crashing right below us with surfers every mornin and evening to entertain us! Walked a block down the street to a local poke store. Close to everything! We will definitely return! A wonderful experience... Thanks so much!! The location was A++. The sound of the waves was great. Being on the 4th floor really improved our already great view. I wish the lanai furniture had been more comfortable but the view made up for it. 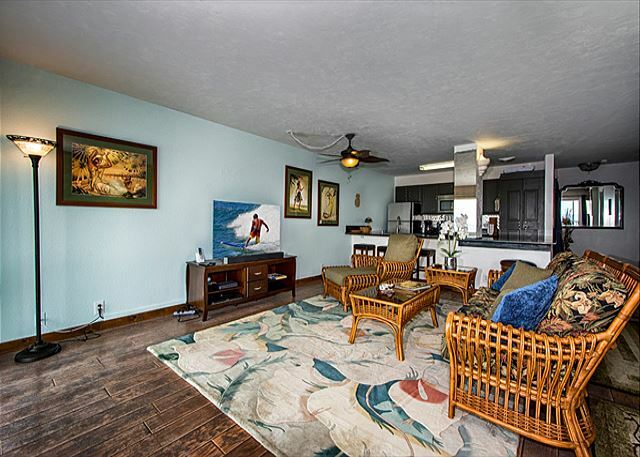 This is a great condo in a great location...right in front of the Banyan surf spot. Knutson & Associates made the whole process super smooth too. We look forward to visiting here again. I love the sound of surf and this place certainly delivered. It's soothing ambiance was glorious. A wonderful spot to relax with the hypnotizing sound of ocean waves. You can watch surfers from your bed! The condo was very comfortable and well stocked. The Hawaiin themed decor gave an authentic island vibe. The owners pride in their special spot came through loud and clear. A real gem! This property was more than perfect for us. The view is a million dollar, jaw dropping view. Wow. 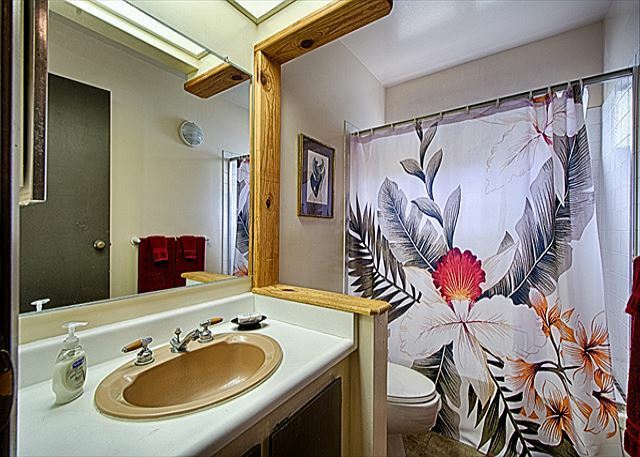 Beautifully decorated, VERY clean, no issues of any kind! We WILL be back! Thank you SO much for an amazing experience. We had a great time. Sleeping with the sound of the pounding waves was incredible! It was comfortable and clean. The only recommendation we would make is for there to be more comfortable pillows. The pillows were so large it was hard to sleep on them. Also, AC would be nice and maybe a basket of toiletries in the bathroom for emergencies...Other than those small things, it was great! This was EXACTLY what we were looking for. 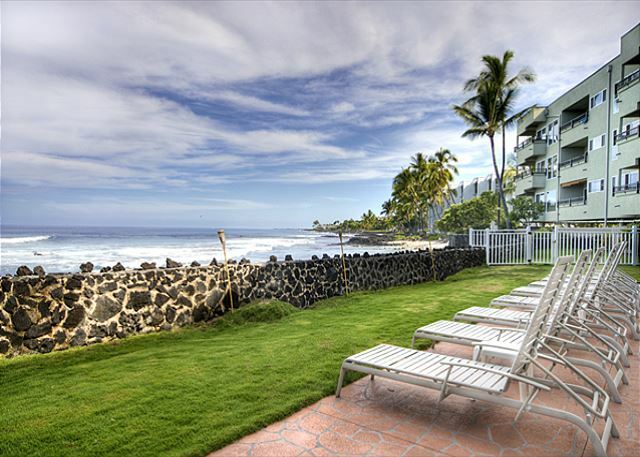 We wanted to not only have an ocean view but also wanted to really enjoy the sound of the waves from our condo in Kona. This unit was PERFECT! Whoever designed the rennovations here really put thought into it. Beautiful design. 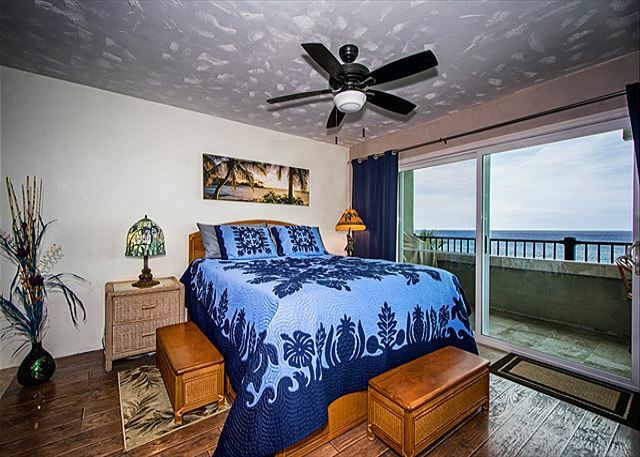 The bedroom is oceanfront so you can hear the waves while you sleep too. The open floorplan is awesome but they also have sliding walls in case you needed to close the bedroom off from the living room while you are there. Beautiful ocean front Condo, with a wonderful Lanai to watch the surfers, we spent so much time out there relaxing... just what we needed... the only downfall is that there is NO air conditioning in the unit, and with no tradewinds, it was pretty miserable a couple of the hot humid nights.. but we kind of climatized to it, after a few days. If there was a portable air conditioner placed in the bedroom, it would have been perfect. We had a great time, and it was perfectly located. Didn't use the kitchen much, because we didn't want to heat up the Condo anymore than we had to. To be honest, we will only stay where there is air conditioning from now on. It's a simple fix, so hopefully this unit will make the small investment on a portable air unit.